Contact Bellevue's Best Local Auto Shop! 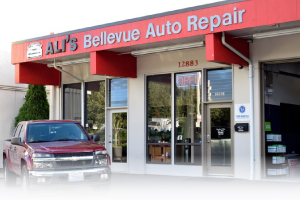 Ali's is local auto repair for the Bellevue area, but customers come to us from all over Kirkland, Redmond, Sammamish, and Issaquah! Call today for knowledgeable service and auto repair Issaquah folks, for instance, are finding worth the drive. In Fact, we have long-time customers all over the Eastside and we are proud to say that we do Auto Repair Bellevue folks depend on, and Auto Repair Redmond drivers have no problem traveling a little farther for. We have very convenient service hours and more auto services than most any local auto mechanic shop. Later weekday hours and we are a rare auto shop that is open on Saturdays as well. Call or email us at the form below today!